Getting support with WPMU DEV is really simple, and we provide you with several ways to contact and communicate with us. Our blog has a helpful post on getting great WordPress support, as well. Check it out! It’s always really easy to get support at WPMU DEV – if you follow the tips below, however, it becomes so easy it’s almost cheating. Use a staging site to test changes and updates BEFORE implementing on your live site. This will save a whole lotta hassle and stress; especially if you don’t want us troubleshooting on your live site. It is not our responsibility to setup a staging site for you. Be sure that you’re using the most recent versions of WordPress, all themes, and all plugins. If you’re looking for something more complex, we’re going to send you to another custom development source from our partnering job board. While we would love to have the time and resources to provide more intensive custom development, we can better serve all of our support customers by having these guidelines in place. Another helpful source, for active members, are our member forums, where you can talk to other DEV members about just about anything, and you can find many threads related to hiring a freelance or contracted developer. Detail how to recreate the issue and where/how it happens. Show the problem through illustrative screenshots where applicable. Inform us of any known conflicts with another plugin or theme; including the plugin name and download link. Be polite! No need to be rude or abusive. It won’t be tolerated. Don’t close your browser window! You’ll be disconnected from your chat session if you navigate away. Open a new window if you need to check something. Do not use Live Chat as a way to check on or “bump” your ticket. Please contact our Customer Service & Account Management team by using our contact form. Just select “I have a different question” as your reason, and your message will go to the right place. Always follow up, your involvement in this process is crucial! Avoid lumping several unrelated questions into a single ticket. 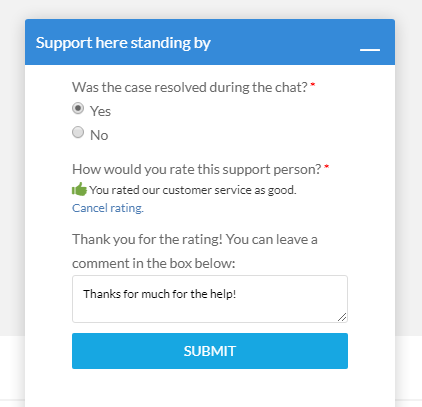 Keep things focused and on-topic by opening a new Live Chat if you have a question that relates to another plugin or issue. Don’t hijack someone else’s ticket unless you’re able to help with the issue at hand. Remember they will receive post notifications too. Even if you have the same or similar issue it’s often best to open your chat session to avoid any confusion or frustration for all members involved. Don’t bump your threads. We respond to tickets in order of oldest to newest, and bumping will only send your thread to the back of the queue. Failure to comply with these guidelines and terms will result first in a warning. Continued infractions will result in being permanently banned from support chats. WPMU DEV reserves the right to ban without warning should we determine that the actions of the participant warrant this. This may be done at any time, by any staff member, at our discretion, on a permanent basis and will not be reviewed. This is for the good of both our members and our dedicated staff. There’s a solid team of people from around the world working together to resolve any and all issues you may have with our products, or even with general WordPress. If we don’t get it right in the first attempt, help us to get it right in the next, and the next one again. Help us to help you! To help you resolve your problem even quicker, there are a lot of fast & easy things you can check on your own. You’ll then be able to provide our support team with more information about your situation when you do need to reach out to them for help. The first place to look would be the Documentation section for the plugin(s) or theme that you are wondering about. This may seem basic, but a lot of people don’t know where to find this information or forget that it even exists when they have a question. Our Blog is also another great resource for so many things. The writing team works hard to provide our readers with quality content such as recommendations of plugins & themes, plus guides for adding certain features to your site. This is a great place to start if you’re unsure whether you are experiencing an issue – or just need help to configure the existing settings. Searching our Support Forums is a great way to see how others have resolved similar issues. Of course, not all situations are the same, so if you can’t find a solution that works for you – just move onto the next steps before opening your own support ticket. The next thing you will want to check is whether you are running the latest version not only WordPress, but also the plugins/themes you are using. If there are any updates available to you, you can find them on your Dashboard on the wp-admin for your site. Always be sure to backup your site before updating. It’s also advisable to test things on a staging site first before moving the changes to your live site. Updates for your WPMU DEV plugins & themes can be found easily in your WPMU DEV Dashboard. If your problem still persists, then it’s time to move onto the next step – a conflict test. To begin, deactivate all of the plugins that you are using and leave only the one that is giving you the issue on. Do you still have a problem now? If not, this means there is a conflict with another plugin that is preventing them both from performing as they should. Slowly turn your plugins on one at a time, testing to see when your issue appears again after each. Eventually you’ll be able to identify the culprit. If the problem persists even after you’ve turned off all of your extra plugins, then it’s time to move to the next stage. Much the same as the plugin test, but now you’re testing themes! Activate one of the super simple default WordPress themes, like Twenty Sixteen or Twenty Fifteen. Does your problem persist? If not, then it sounds like your plugin is conflicting with your theme. If so, you’ll need to move on to more advanced stages of troubleshooting or, if you aren’t comfortable doing that on your own, you can always reach out for help. Choose related product/service – select from a list of our most popular products if it’s a specific plugin that you need help with. Or select “Other” if it’s for a different plugin or other WordPress related issue. What is your skill level – if you think you may need some extra help understanding how things work, then please select “talk slowly” so that our team has a general idea of where your knowledge level is. If you are a developer yourself or have extensive experience managing your own websites, you may wish to select “Geek speak” so that our team knows you’re already familiar with the basics. NOTE – Please be aware though that these are just general guidelines and a lot of people have different ideas of what qualifies as “Geek speak” levels of knowledge. If you feel like our support team is talking a bit over your head, please let them know so they can explain things in more detail. We all start somewhere, and we want to be able to communicate with you where you are now. What is your issue? – Summarize the problem that you are experiencing. Please include as much information as you can. After you’ve filled out the pre-chat survey, just click “Start the Chat”. If you click this mail icon then you’ll be able to request a transcript that will be sent once the chat session has completed. This is definitely recommended if you’d like to be able to reference the conversation later. Next you’ll see the message history where you’ll be able to read over what was sent to you, and the replies you’ve sent as well (in blue). And at the very bottom is the messaging area where you type your message. On the right of the message box you’ll also see a small paperclip that allows for you to attach files to the chat so that you can share important information with our support team. When you’re done, just click the white X at the top right of the chat window, in the blue bar. This will end your chat and give you an opportunity to provide us with feedback regarding your experience. We really love to hear from our members, so please take the time to fill out this quick survey! It’ll help us continue to improve our products and services, and make sure that your favorite support guys get the recognition they deserve. Sometimes the questions you have or the issues you are reporting are too complex for our first tier support team to handle in live chat. This can happen if the team needs to consult with a developer, or bring in the assistance of our second tier support experts. In these situations, our team will open a support ticket for you on our forums. Once the ticket has been opened, you’ll be able to find it in the support section of the Hub. Our team works in order from oldest to most recent, so no support tickets will be overlooked. 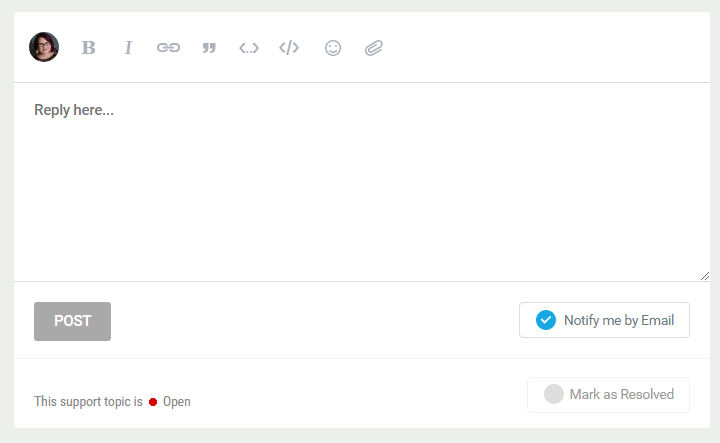 You can see in the screenshot above that there are several different options for formatting your reply, as well as including hyperlinks and even attaching certain types of files. When you’re done, just hit “Post” and your support ticket will be added to the queue once more. If you do not need any further assistance, just select “Mark as Resolved” when replying. Or click the “Mark as Resolved” button on the right hand side navigation. Who do you turn to when things on your WordPress site aren’t working? WPMU DEV provides incredible 24/7/365 support for all things WordPress. And, the WPMU DEV Dashboard plugin allows you to grant our team of support heroes secure access to the backend of your site without releasing your confidential login information. Activate it when you need us to unlock a super secret access point for our support heroes. It’s like the bat signal but better, and it couldn’t be easier to use. You’ve now successfully granted support access! Access will remain open until you choose to end it. Use the “End Session” or “Extend” access buttons to close or extend access through your current security token. Review our Getting Support Guidelines for important information on how we use access to debug issues. By granting our support team access to your site, you agree to allow us to debug. Awesome! But is it really secure? When you click the “Grant Access” button a random 64 character access token is generated that is only good for 96 hours (5 days) and saved in your Database. This token is sent to the WPMU DEV API over an SSL encrypted connection to prevent eavesdropping and stored on our secure servers. This access token is in no way related to your password, and can only be used from our closed WPMU DEV API system for temporary access to this site. Only current WPMU DEV support staff can use this token to login as your user account by submitting a special form that only they have access to. This will give them 1 hour of admin access to this site before their login cookie expires. Every support staff login during the 5 day period is logged locally and you can view the details on this page. You may revoke this access at any time, which invalidates the token and makes it unusable. To make it easy for you to get in touch with us, you’ll find a Contact link at the bottom of every page on our site! Simply make a selection from the drop-down menu to get the type of help that suits your needs. Each of our plugins and themes has its own project page with fantastic information about its features and functionality. Perhaps you have read through this information and still have questions. Selecting this option will direct you straight to our contact form where our Pre-Sales team will be happy to fill you in on what you’d like to know. You were happily humming along working with your WordPress site when everything suddenly burst in figurative flames… or maybe you just have a technical question you’d like some help sorting through. Don’t worry! Either way our team of support heroes is ready to save the day! Selecting this option will take you to our support forum where you can search the threads for a solutions to issues you may be experiencing. For our Premium WPMU Members, a special form will open where you can ask our experts any questions about using our products, services, or anything related to WordPress. A support thread will be created in our forums where the team will respond directly with super helpful information. If you find that the other contact options just aren’t a match for a situation, this option will lead to our contact form where you can freely fire away! We’ve got you covered with a Jobs Board available to our Premium Members. You can post any Custom Development jobs you need completed along with your budget and any specifications you wish to include. Get connected with the right developer for your project!